The Pleasanton and Jourdanton police departments are challenging each other off the football field this Friday, Sept. 15 to see who can raise the most money for St. Jude’s Children’s Hospital. The officers will be collecting tips in front of the Chili’s restaurant from 11 a.m. – 2 p.m. Last year the restaurant raised $3,100. Their goal this year is $5,000. A fall festival is also planned soon. 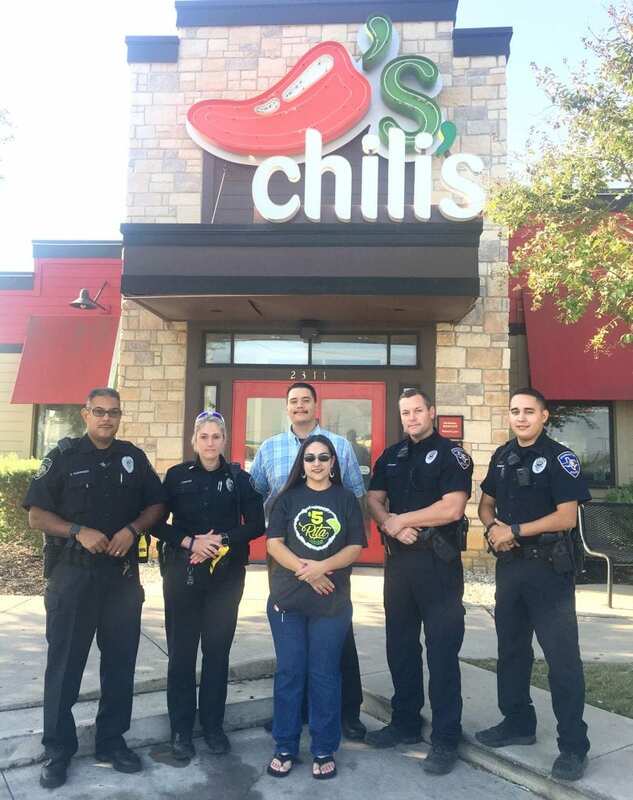 Left to right are Pleasanton officers Armando Rodriguez and Jess Chia, Chili’s manager Joseph P. “Boomer” Mango III, Jennifer Alaniz, St. Jude’s Hope Captain; Jourdanton officers Michael Gilbert and Tim Sawicki. Many local residents are awaiting the rivalry football game between Pleasanton High School and Jourdanton High School, this Friday, Sept. 15 at Eagle Stadium. The rival cities will also match up earlier that day, for the 2nd annual Tip-A-Cop fundraiser, at the intersection of Highway 97 and Airport Road, in front of Chili’s. The event will take place from 11 a.m. to 2 p.m. on Sept. 15. Join the Pleasanton Police Department and the Jourdanton Police Department and Chili’s as they fight for a cure. Let’s raise awareness, as we raise money to help find a cure for cancer. Funds will benefit St. Jude Children’s Research Hospital. Be sure to stop by and Tip-A-Cop and show your support.